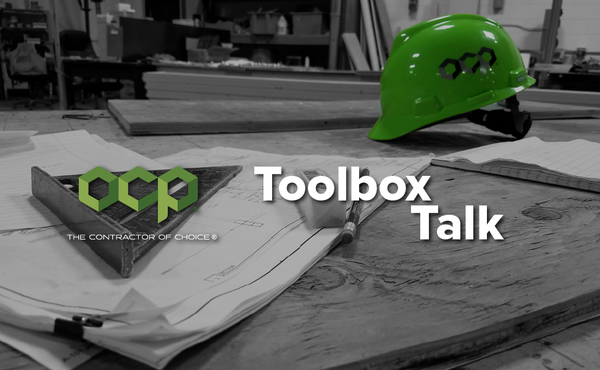 In this month’s Toolbox Talk we discuss how to work safely in cold weather conditions to avoid cold stress, hypothermia, frostbite, and general hazards. I’ll also share clothing and food tips to keep you warm without restricting work. The effects of cold stress can be felt in temperatures as high as 59 degrees Farenheit, and are made worse by wind and moisture. Cold stress occurs when blood flow is shifted from your extremities (hands, fingers, toes feet, etc.) to your core, thereby causing exposed skin to cool rapidly and increasing the risk for frostbite or hypothermia. If you or a fellow teammate are experiencing the effects of cold stress take shelter in a warm area, remove wet clothing, wrap the effected person in dry blankets and cover their head. You can avoid cold stress by adhering to the following tips about clothing and diet. The innermost layer - Your innermost layer of clothing, closest to your body, should be made of a synthetic fabric that allows for ventilation and wicks away moisture to maintain dry skin. The middle layer - Your middle layer of clothing should consist of down or wool to insulate and absorb sweat. Cotton is not suggested because it typically gets wet quickly. On the opposite side, wool and synthetic fibers maintain heat even when wet. The outer layer - Your outer layer of clothing should be a breathable, waterproof fabric to prevent water and air penetration. Not too tight - Make sure your clothing is never too restricting. Clothing that is too restricting can limit blood flow used to improve body temperature. Tight clothing also restricts your ability to safely move about to perform work. Bring extra - Bring extra clothes to stay warm. It’s always better to be prepared with items that you don’t need, than the other way around. Cover the extremities - Your face, ears, head, and feet are essential to keep warm. Boots should be waterproof and insulated. Wool socks absorb sweat and keep feet insulated. Wear gloves and mittens made of waterproof fabric that does not interfere with work. Wear a wool knit cap or liner to keep your head warm. Metabolism - Your metabolism is essential for producing energy and heat. Balanced diet - Eat and drink warm, high-calorie foods at lunch and breakfast. Consume a balanced diet of protein and carbs to maintain energy. Don’t consume the following - Avoid caffeine and alcohol as these can impair the body’s natural warning reactions to cold. Together, we can all make the jobsite a better place. Aside from maintaining safe practices, you can help by watching for others when working in cold conditions. As always, if you have safety questions or would like additional training, please contact me or your local safety director.